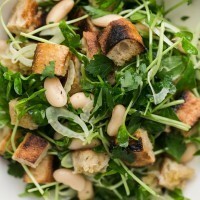 White Bean Salad with Pea Shoots | Naturally.White Bean Salad with Pea Shoots | Naturally. Light grill (or alternatively, use broiler). Cut the baguette in half like you would to make a sandwich. Cut end off garlic and rub the cut side on the cut part of the baguette. Brush with olive oil and place the baguette cut-side down the grill. Grill until the bread starts to char and is toasted, flip, and repeat. Watching closely as this process goes fast. If using a broiler, stick cut side up under the broiler until toasted, flip, and repeat. Either grilling or using the broiler will take roughly 1 to 2 minutes (if that). Let bread cool then chop into cubes. In a bowl, combine the pea shoots, spinach, beans, fennel, and parsley. Add in roughly 2 cups cubed bread. In a small bowl, whisk together the ingredients for the dressing. Pour over the salad and toss until everything is well combined. Taste and add more salt as desired.